With Easter Morning right around the corner, I have been brainstorming some delicious breakfast options for you. I adore Bananas Foster. Seriously. Banana and caramel, what is not to love?! 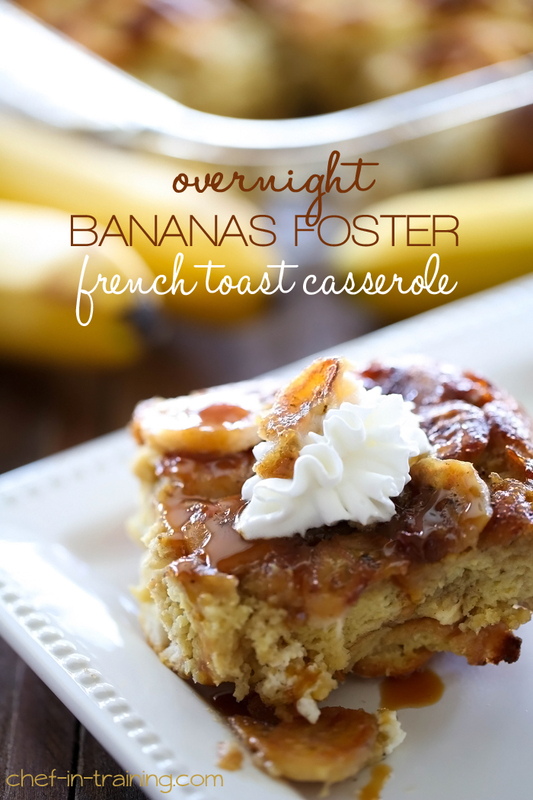 This Overnight French Toast Casserole is so unique and so incredible. We served this for some company and everyone LOVED it! The bottom is saturated with gooey caramel-banana goodness that creates the perfect flavor to top this casserole. It serves a crowd and is so easy to make. All the work is done the night before. All that is required in the morning is to throw it in a preheated oven and let it cook to perfection! Easy Peasy right?! I know you will love this as much as my family did! This recipe is absolutely PHENOMENAL! And best of all, all the work is done the night before and just needs to be popped in the oven in the morning! In a medium pan, melt butter, brown sugar, corn syrup on stove over medium heat. Cook and stir until sugar is completely dissolved. Once sugar is dissolved, remove from heat and add vanilla and cinnamon. In a medium bowl, combine eggs, milk, sugar, vanilla, cinnamon, nutmeg and pinch of salt and whisk together until completely smooth and well combined. Cover casserole and refrigerate overnight. When ready to bake, remove pan from refrigerator and leave it out on the counter while oven preheats to 375 degrees F.
This sure does look delicious. Almost like dessert in the morning which is just how I like to start the day. This looks delicious! Do you think I could substitute honey for the corn syrup? I've been dreaming about bananas foster ever since I made a bananas foster banana toffee cake for Christmas last year! This will most definitely be on the bill for next time's fancy breakfast. Glad you shared this! This looks amazing! I can hardly wait to make it....pinned. We have a weekly Breakfast Club at my school - this looks like another great casserole to add to ,my ever-growing rotation of "favorites" to bring in! This looks amazing!! I am completely drooling right now!! what is caramel banana topping and where do you find it? haha... never mind, I just figured it out! Could I make this 24 hours ahead instead of just overnight or is that too long? Thought it was good overall, however, I was not a fan of the cream cheese in it; I am a HUGE fan of cream cheese. I will definitely make it again but think that next time I will leave out the cream cheese and replace the milk with heavy cream, and increase the amount of liquid. I made this French Toast Casserole the other day for my family and they thought it was the best breakfast they ever had. This casserole is phenomenal. My husband and son fought over the last piece. It is easy to make, and absolutely delicious. Thanks for sharing this recipe. I look forward to trying many more of your recipes in the future!! Can this be made and frozen? I don't see any answers to any of the questions below so throwing my own out there. I am so making this for my family this weekend. It looks soooooooo good! I made this for Thanksgiving morning. It was fabulous! Made it just like recipe calls for except I used the entire 8oz package of cream cheese. Made this recipe the day after Christmas for my family. It had a great flavor but I agree with the earlier posts the cream cheese felt out of place and did not melt or dissolve very well and seems unnecessary in the recipe. I would have doubled the topping as it was very thick. It reminded me of bread budding with a caramel sauce vs. a true banana fosters rum flavor. Do I have to refrigerate overnight?? Or can I make it and cook it? I was wondering the same thing. I am actually gonna make it tonight for dinner so I guess I will find out! Way too sweet! I will half all sugars next time I try it. Also, my device forced me to 5 star. It is more like a 3 when following this recipe exactly. I made this for dinner last night and the first bite I took I was in heaven! This was so good. I will admit it is a very sweet so next time I too will cut back on the sugar. After reading some of the reviews I decided to make a change with the cream cheese. Instead of just putting pieces of cream cheese throughout I took my cream cheese and added some powdered sugar and heavy whipping cream to it and mixed it with my mixer. Then after the first layer of bread I evenly spread the cream cheese mixture then put the last layer of bread over top. I also did not let it sit overnight just made it up and put it straight in the oven. The reason I gave it a 4 star instead of 5 is bc of the change I made with the cream cheese and the fact it was just a little too sweet. Overall we were very satisfied and I will be making this again. Turned out pretty good. Cant for the life of me figure out the cream cheese and why we need it. I dont think it added anything to the recipe. Ive used cream cheese before with pumpkin french toast but i creamed it with powdered sugar and cinnamon..maybe i should have tried that. My "taste tester" on the first bite said, this tastes exactly like bananas foster! I may add it to the rotation! I love that i can make this the day before guests arrive and that i dont have dishes in the kitchen! Will definitely make caramel sauce again! This is the BEST dessert I have, by far, made. It absolutely blew all my friends' and family's mind. As one of the comments here mentioned about replacing cream cheese with heavy cream (35%), I wanted to follow that as I like my desserts more moist. It was a very good idea and appreciate it.